My cousin Chad is just a couple years older than me. As kids, I was always one step behind him, whether it was playing ball in the backyard (where his wicked curve ball not only tore the laces from my dad's mitt, but it taught me to step out of the batter's box if the ball breaks toward your thigh), revving up the three-wheeler through my grandfather's pasture (our paths are now the site of Chad's parent's home), or rollerblading feverishly through the streets of Eagle Lake (his ice hockey skills made him a pro. Me? I looked like a baby deer learning to walk. I'm quite graceful). Needless to say, I have always looked up to Chad. And I still do. Now more than ever. Six years ago, Chad was diagnosed with Multiple Sclerosis, a disease that disrupts the communication between your brain and body, creating immense pain and making movement difficult. He's been bravely battling the disease ever since, proving to everyone around him how strong he truly is. It's times like these that you wish for superhuman powers, for some ability to affect the fight, but that's only in the funny books. One of the greatest ways to support my family and the fight against MS is to participate in the annual MS Walk, a winding trek through Minnehaha Park in Minneapolis (the walk also occurs in cities through the country, so if you would like to participate, it's quite easy). The walk is this Sunday (May 2), and Jen and myself will be once more showing our support. This will be the first time our 'little walker' will be joining us, and I'm sure Alex will be waddling away with the rest of the crew. I understand that in this current financial climate, finding the funds to support even the best causes has become increasing difficult. So I'll just throw it out there. If you'd like to donate, any amount is greatly appreciated. To make a secure, online payment, all you have to do is CLICK HERE. Okay, how cool is this gonna be? Dawning, the frightening flick I worked on a couple of falls ago, will be screening for 3 WEEKS in Mankato! Premiering April 16th, the feature - shot on a shoestring budget by local director Gregg Holtgrewe, with a small, dedicated crew and cast - will be showing at the recently renovated Spectrum Cinema (formerly the Mall 4 theaters, for those 80s Kato kids). The theater, currently playing second-run flicks, offers discounted tickets and concession prices. I mean, $3.00 to see Dawning? Now that's a deal. The folks at Spectrum will be hosting a premiere event for the flick on the evening of April 16th, with director Holtgrewe and other cast and crew present. Now here's some bummer news: I will not be able to make the event. It breaks my heart. Jen, Alex, and I will be whisking away to Naples, Florida that weekend to visit our good friend Sam, and to introduce Alex to the ocean. The good news? The film is screening for 3 WEEKS, remember?! So while I cannot make the premiere, I will definitely be making the trip to Mankato to see the film, hopefully with a number of friends and family in tow. So if you're in Mankato, and you want to see a solid, gripping horror movie that relies on the strength of its characters and situation, and not on the number of buckets of fake blood poured on its actors, then please check out Dawning. You will not be disappointed! Oh. Hey! How's it going? Okay, I know I need to start this with an apology. Here I am, promising to keep the handful of you abreast of what's happening in my life, and then I go and vanish from the Interwebs. Where'd ya go? you're asking. 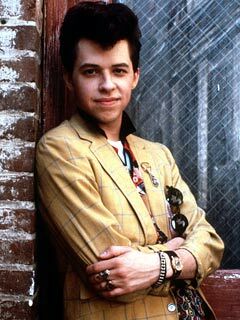 Did you witness a murder, and were you then forced to enter the Witness Protection Program and hide out as a high school student like Jon Cryer in the movie...um, Hiding Out? As cool and hilarious as that sounds...it's far from the truth. I've just been away. And it's not like there haven't been exciting things to share. The last couple of months have been full of milestones. 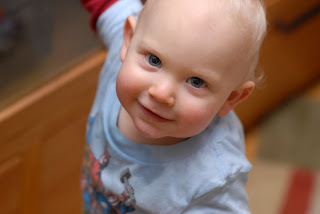 Since I've last posted, Alex has gone from tentative crawling to stumble-stepping on his own. Sure, he looks like he's failing a field sobriety test and his progress is often thwarted by a pesky rug, but he's walking. And it's damn adorable. He also decided one day that he wanted to climb the steps. Never showed an inkling that he cared about them. Then all of the sudden, a knee went up. He pulled himself onto the first step. Realized it was aces. And went the rest of the way. 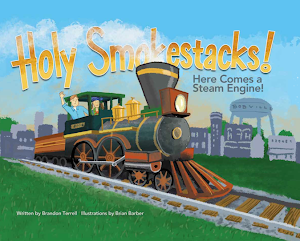 He loves books, enjoys flipping through the pages and warbling in his newfound half-babble, half-yodel language. His book-loving pops can't get enough of that! So yeah, there are things I could be sharing. And I know a number of superhuman folks who find the energy and stick-to-it-tiveness to blog on a near daily basis about their child's activities. Nary a tooth goes uncut without a photo posted online to commemorate the occasion. And I commend them. I wish I could do it. When I find the extra hour (and by that I mean summer television season), I'll try harder to update you on the wonderful world of Alex. But I'm trying to keep this blog a respectable combination of my personal and my professional worlds. I've been fortunate enough to visit a couple of elementary schools this spring to talk about my chapter book Drake Bacula: MonSTAR! 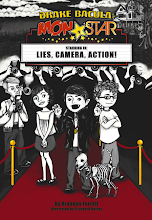 (available on this website...cough...cough...shameless...) I go into a school, talk to the kids a little about the elements of storytelling, and then we do a fun little interactive project where we write a movie for the book's titular character, Drake Bacula (Movie star! Vampire!) to star in. The results are always hilarious. From stories involving an accountant named Frank N. Stein to Drake fighting a giant, evil newt named Dr. Figg, it's easy to see the kids are brimming with creativity. My first visit was quite surreal, as I stepped into the hallowed halls of Washington Elementary School in Mankato. From grades 4-6, I pestered the teachers of Washington with my loud mouth and obsession with the Hardy Boys. So I was honored to come back, to walk the halls again, and recall some wonderful, fond memories (though I'm thinking the time I was kneed in the groin in 6th grade, sent to the nurse's office with an ice pack, only to have my teacher send down the girl I had a crush on to check on me doesn't necessarily fall under the 'fond memories' category). And considering I spent so much of my time in the library, it was all the more special to present there as well. Now, funny story about the Hardy Boys. During the presentation, I ask the students about their favorite books, and when I rattle off my faves, I make sure to include Frank and Joe (if you don't believe my obsession, ask my wife to show you the giant container currently holding over 150 HB books in our basement). After the first presentation, I notice the librarian scouring the shelves. I ask her what she's looking for. "The Hardy Boys," is her response. Sure enough, she discovers five hardcover mysteries, the old tattered single-colored library editions on the shelves. The ones that use words like 'chum' and 'jalopy' and 'neato.' The ones where Frank and Joe search for clues behind old grandfather clocks, or track down the door to door leather goods salesman who robbed them (The Criss Cross Shadow, I kid you not). The books looked the same as they did when I was a small lad, save for one change: they all had bar codes on them now. Well, the librarian opens a couple of them up, looking in the back for the old-fashioned check-out cards. And lo and behold, a couple of them still had them. And whose name just happened to be scribbled at the top of both cards in well-practiced cursive? I couldn't believe it. So very amazing. The media specialists were so gracious, offering one of them to me as a keepsake, while keeping the other for posterity. 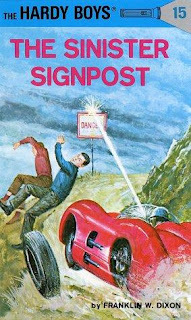 So I am now the proud owner of the library card for The Sinister Signpost, featuring my name, my good friend Brad's name, and the name of the aforementioned groin-kneeing story perpetrator. I was also asked to visit the astute kids down at Byron Elementary School, down by Rochester. I was a little nervous, having no knowledge of the school, and no friends teaching there (I neglected to mention my friend Eric - I mean, Mr. Miller - now teaches at Washington, in my old 5th grade teacher's room, no less!). But I was immediately put at ease, speaking to some razor sharp students with vivid imaginations. They were quite excited about the book, and I had a really great time speaking with them. Later this week, I'll be traveling to Kato once more to speak to the students at Hoover Elementary, where my nephew Kaleb will start kindergarten next year. An old family friend teaches there, and she was gracious enough to help set up the visit. I'm looking forward to catching up with her, and introducing the kids to the wacky world of Drake Bacula. Should be a lot of fun. So I suppose, in the end, I guess I have been hiding out in schools. And here, the only thing I thought I had in common with Jon Cryer was our mutual annoyance toward Charlie Sheen. Well, looking at the length of this post, I'm starting to feel like I'm compensating for something here. So I'll leave you alone soon enough, with the promise of fun news in the near future. I swear.